The Raiders, draft gurus extraordinaire have already waived their 6th round draft pic, defensive end, Stryker Sulak. See, that's what's wrong with the franchise. They get rid of guys named "Stryker Sulak." Funny report out of San Francisco. Insane football coach, Mike Singletary, reportedly made rookie WR Michael Crabtree cry during practice. Apparently forgetting that this isn't Texas Tech an ymore, the rookie WR disobeyed orders and starting running on his newly healed foot before doctor's cleared him to. Coach Mike didn't like that. However, Singletary himself swears he spoke to Crabtree and just told him to stop, no screaming. That doesn't sound so bad, so why then the tears. 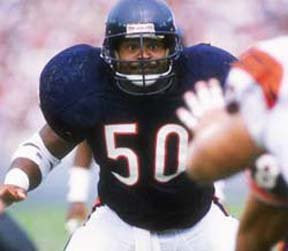 Well, if anyone remembers how scary Singletary was when he was MLB for the Bears, how intimidating he was, then maybe you wouldn't blame Crabtree so much.Back in his prime, Singletary could put the fear of God into God himself. Joba has added a hesitation in his arm action just after he breaks his hands for his breaking balls. This hesitation helps prevent his arm from rushing through his wind-up which helps him have better control of his pitches. At first, Joba’s arm was too fast for his body and this threw his timing off. Now he gives his body more time to get in front so he could deliver a strike. Joba began using this hesitation with his fastball as well. He would use this hesitation whenever he wanted to increase the likelihood of throwing a strike. What you get out of this though is a fastball with more command and less velocity. Interesting stuff, but considering that Chamberlain's walks are way up this year, his Ks are down and he has already hit 10 batters so far, I can't say that its working. What Joba did yesterday, go after batters aggressively, not waste pitches by being too cute and getting ahead on hitters. Especially later in the game, when Chamberlain seemed to gain more confidence after a shaky start, he went after the Tiger lineup and dominated, striking 5 out of the last 6 batters he faced. IMO, Joba Chamberlain can throw some nasty stuff. And now it seems he's learning to pitch some nasty stuff as well. Watching Mike Mussina pitch Old Timer's Day yesterday (which was really weird btw, him pitching just 8 months ago and now pitching to 70 year old guys), the thought came up: "Does Mussina make it to the Hall of Fame?" Going against him, he never won a Cy Young or a World Series ring. He didn't make it to 300 wins (though by his choice, he could have probably made it if he dragged his career out a few more years). And while he was a really good pitcher, he was never really a dominant pitcher; never one of the "best" of his generation, like Pedro Martinez or Randy Johnson. On the plus side, he has a spectacular win-loss percentage, 270 wins to 153 losses. He's 88th all-time for adjusted ERA+, tied with Juan Marichal and ahead of guys like Bob Feller and Don Drysdale. He's 14th all-time in BB/K ratio. He's 19th all-time in strikeouts, has 7 Gold Gloves and—more important than people might think—he was well liked by the sportswriters. So how does all of this shake out.....I don't think Mussina makes it. He has an outside shot, but I just don't see him in there. The NBA is the strangest place. Every summer, during free agents, guys like Paul Millsap get fought over/ridiculous money despite the most pedestrian of stats. Then, the second the season starts, all these teams try to dump these gargantuan contracts shackled to their roster. Seriously, Paul Millsap is an undersized PF who averages 13 points and 8 boards a game. How the heck does he get 32 million for 4 years? Guarantee that somewhere down the road, you'll hear about the Jazz trying to trade him to take his salary off their hands. Same thing for the Nuggets and the 5 years, 26 million dollar bomb they donated to Chris Andersen (6 pts per game, 6 rebounds, 2 blocks), and the Magic who resigned the immortal Marcin Gortat (4 pts, 4.5 rebounds 0.8 blocks per game, 5 years, 34 million). A couple of weeks ago, I said that an interesting rumor floating out there was that the Braves, who had solid starting pitching—and Tim Hudson coming off the DL soon— might be interested in trading Javier Vasquez. Well forget that. Since June 18th, Vasquez has thrown a 1.08 ERA, and that includes games against the Red Sox, and Phillies. Unless some team is prepared to give up their stadium, their entire minor league system and the Ghost of Babe Ruth, Vasquez won't be going anywhere this year. 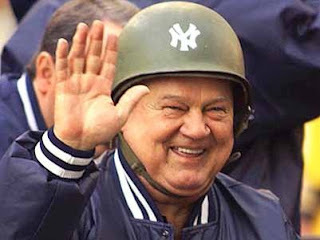 And lastly, it was great to see Don Zimmer at Yankee Stadium yesterday for Old Timer's Day. The man is baseball made roly-poly flesh. He should be allowed to go into whatever stadium he wants. Stryker Sulak sounds like a bounty hunter in the Star Wars universe. What a great name. It seems like Joba is holding back so he can throw more pitches. He has not been starting all that long, and he was probably instructed to avoid rearing back every time. Any change in routine for a pitcher can cause control problems. He is still in transition. I have to think that Mussina gets into the Hall. He spent his career pitching in arguably the two worst ballparks for a right-handed pitcher. Right field in New York and Baltimore is juicy for a left-handed hitter. This effected his ERA, which is why his win loss percentage is the key stat for him. He was not dominant in terms of having a couple of unhittable years like Johnson and Pedro, but he was always one of the better pitchers in the game...often in the top 5. I would argue that his body of work is sufficient to make the Hall, though not first ballot worthy. If he had tried to pitch a 2 or 3 more years, he could have gotten his 300 wins and 3000 strikeouts. As it is, he is 33rd in wins and 19th in strikeouts ALL TIME. Virtually everyone above him in these categories is in the Hall. Pete, great comments. Good points on Camden and Yankee being brutal for righty pitchers. And I agree with you on his stats. I would put him in the Hall, I just don't think the writers will. They seem to have that "300 and in" mentality. Ask Tommy John or Burt Blyleven. And yeah, I kind of agree with your assessment of Joba. Same thing with Hughes. As soon as they pushed him to the 8th inning and told him to let it rip, he's been going after hitters and dominating.